We are very pleased to announce the opening of our brand new warehouse and showroom in Liss, Hampshire! Our new enterprise will allow us to offer our services to an even larger geographical area. 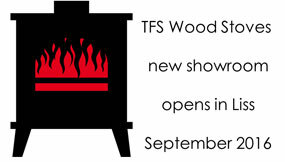 There will be an impressive range of both solid fuel and gas stoves on display including stoves from Contura, Charnwood, Stovax, Jotul, Dovre, Clearview, DRU and Gazco. Please come and pay us a visit but call first to make sure we'll be there, 01730 890200.